Now that you’ve seen everything in and around Pensacola, or at least as much as you could see depending on your timetable, it’s time to start your journey east. Go south on US 98 and cross the Gulf Breeze Parkway until you get into Gulf Breeze itself. But before you get too far, there’s a historic marker at the intersection of US 98 and Fairpoint Drive. 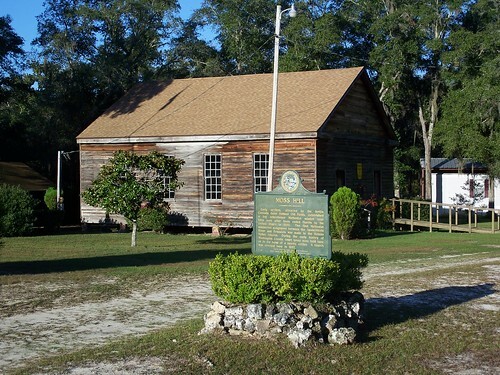 It marks a point along the first federal highway in Florida. It was built as a military road back in the 1820s. I don’t think any of it survives today, but you can look for it in the Naval Oaks part of the Gulf Island National Seashore. It’d be in the part north of US 98. First, though, Fort Pickens. Hang a right at the aptly named Fort Pickens Road and head west. You’ll get to an admission station, where you’ll have to pay 8 dollars to go further. On the plus side, it allows you access for a week, so if you’re staying in Pensacola for a few days, it’s an even better deal. Fort Pulaski up near Savannah has a similar policy. There’s probably more lake that in the National Parks system. Check ahead before you go, though. Really bad weather can wash the road out. If that’s the case, you’ll have to walk or bike the rest of the way. It’s several miles, so best to know before you go. As you’ll see, the road is like 6 inches above sea level, and cuts through the beach. There are starkly white sands to either side of you. I wonder if they’ve considered building low walls to protect the road? Or maybe an elevated road. Even one 3 or 4 feet tall would alleviate the closures. There’s some mini-sidetrips along the way, but eventually you’ll get to the fort itself. Pretty impressive, I have to say. Amble around and climb up to the higher level to get some great views. If you look to the west, you’ll see the east end of Perdido Key, where lie the remains of Fort McRee in the Perdido Key Historic District (Fort McRee). And if you turn your gaze about 45 degrees to the southwest, you’ll be looking in the direction of the remains of the USS Massachusetts. It was sunk off the coast some years back. It’s one of the Florida Underwater Archaeological Preserves, and divable, when conditions are favorable. If you want to check out another state park, go over the CR 281 Bridge to Yellow River Marsh. I’ve not been there, ’cause I couldn’t pin down where it was on my previous trips. I know where it is now, but seeing it on Street View, I’m not that tempted to visit. It looks to be mostly for hikers. Not my scene, man. Now you have a choice. The fast way or the slow. Fast is continuing on US 98 for the next 15 miles or so. It’s rather ordinary, just road and trees and houses and malls. Not super developed, but hardly wilderness. You can’t see that much of the water, either. Or you can go south like you’re going back to Fort Pickens. 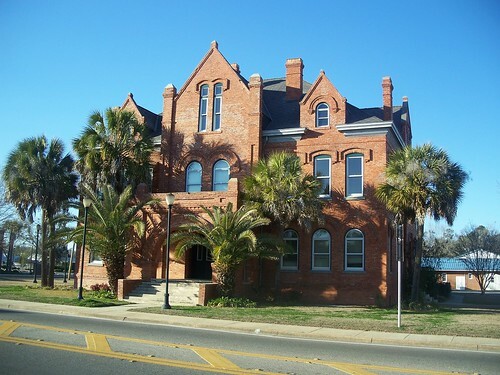 But instead of taking a right at Fort Pickens Road, stay on Pensacola Beach Boulevard/Via Luna Drive. This will take you through Pensacola Beach. Slow going, as it’s very residential. There are some spots along the way where you can park, cross over on a boardwalk and be on the beach itself. Eventually you’ll get past all the condos and restaurants, and be in another section of the Gulf Island National Seashore. You can see this part for free. There are a few large parking lots, where you can stop and see more beach. There’ll be sand dunes here and there too. Eventually you’ll reach the end of the road. If you go straight, you’ll enter Navarre Beach Park. It used to be a state park, but not for long, as for various it reasons reverted to the county a few years back. Hang a left, and you’ll cross Navarre Beach Causeway and rejoin US 98. Another 12 miles, or thereabouts, and you’ll be in Fort Walton Beach. You’ll find two NHLs here, one that’s been here for centuries, the other far more recently. You’ll encounter the recent one first, the Governor Stone. It’s an old schooner, and it’s moored in The Boat Marina. It’s been moved around a lot, from Apalachicola to near Point Washington. It wound up in Fort Walton Beach only a few years ago. Call the Marina, and they’re usually happy to show off the boat. Watch out for the wandering avians, as there are ducks and peacocks and attack geese wandering around the parking lot. There’s a small dinosaur on a raft next to the marina, visible from US 98. Commissioned by the owner of the marina, apparently. Hey, it’s Florida, you never know what you’ll find on the side of the road. Get back to Fort Walton Beach, cross the mouth of the Choctawhatchee Bay and you’ll be in Destin. This is where the other McGuire’s is, but I’ve not been in this one. I’m sure it’s as good as the original in Pensacola, though. My food rec here is Fisherman’s Wharf. They have an award-winning gumbo, and I can attest to its scrumptiousness. Plus they’ll actually cook fish that you bring in. So if you spend a day here fishing, you know where to bring the results. Back on US 98 and heading west, you’ll finally escape the sprawl of Destin and have the open road ahead of you. Keep your eyes peeled, though, since one of the prettiest parks in the state is right off here. At CR 395, turn left. If you go right, it’s another way to get to Seaside, and you’ll go through the Point Washington State Forest. But you’re going north, so follow the signage. You should keep your maps handy, though, as it’s easy to miss the street to go down. Soon you’ll reach Eden Gardens State Park. A gorgeous old mansion, azaleas all over the place (March is a great time to visit), other plants too, places to picnic, and a spectacular view of Tucker Bayou. I was there Easter Sunday morning just after dawn, and it was like a dream. I’d love to spend a day there, or at least a leisurely afternoon. Go, see it, you won’t regret the diversion. Next post we’ll finish our tour of US 98 in Panama City. See you on the road!